Someone is going to love this! What a great idea! My brother won the Ugly Sweater contest this year at his office. (With a sweater featuring the Holy Family, which I think takes nerve…) Now I’m thinking he may need a quilt, though perhaps a mini quilt might be plenty. I’d love to start with your block! That would be a great decoration either as a pillow or wall hanging for my daughter who throws an ugly Christmas sweater contest every year and decorates for it. That is precious! I would love to add this to my Christmas decorations! Congratulations on the block that was accepted. Now who wouldn’t like that block! Love it… I give my kids crazy stuff every year. They are such sweethearts they actually display them to! I think their Grandma Holt started this when they were baby’s! When they left home I sorted their bits out of the x-mas decorations. Very sentimental! I would love that block! I certainly would love to take that block off your hands! I don’t know why it was rejected. It would be fun to make a throw with different “Ugly Sweaters”! I’d love it! 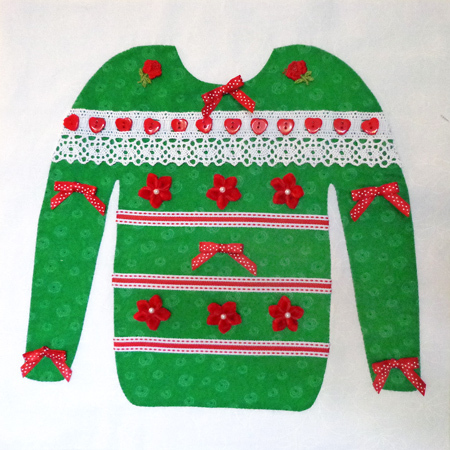 Truly is an ugly sweater but it would go well in a mixed quilt! I think it is lovely. Who dares to call it ugly? I just love it! Please send it to me so that I can include it in the xmas quilt I am planning. 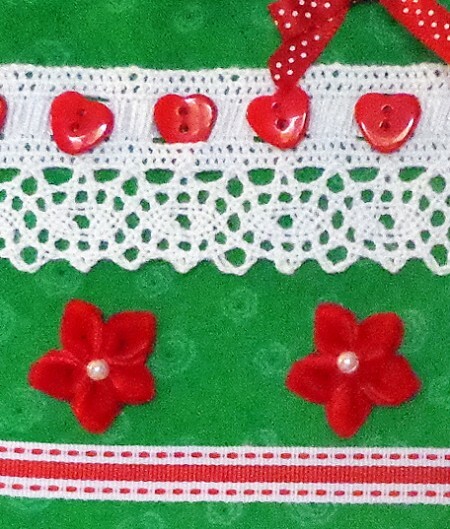 It is going to be from your Christmas to Applique book. If you don’t, I will have to make a similar copy and give you credit. Oh I would love to have a Kay Mckenzie original! I can provide a good home for your block, hehe. Congratulations on having another one of your blocks in Quiltmaker’s 100. I think it’s adorable. I would love to give it a home. This is so cute. Wouldn’t this make a great block exchange where everyone makes their own ugly sweater. Cute, cute, cute. Thank you for sharing. I’m not sure why they didn’t want this block – it’s adorable! Ugly Christmas sweaters are so trendy – I think they missed out on this design.